Where do I get statements for my Clipchamp subscription? You can download a receipt or invoice for a Create, Utilities or API subscription charge or one-off purchase from your user profile page. This page can be accessed by clicking on the account icon in the top right corner (when you are logged in) and choosing Manage Billing or My Profile. For detailed instructions please see below (Follow the steps under 1 for Create, or under 2 for Utilities and API products). 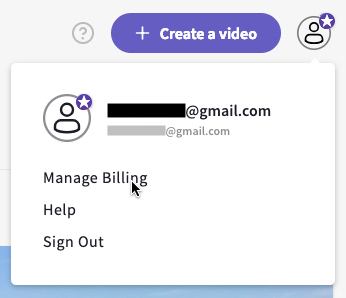 To download receipts for a Clipchamp Create subscription, log in to Create and click on your use icon in the top right corner, then choose Manage Billing from the dropdown (or go to: https://app.clipchamp.com/account). Then, scroll down to the Invoice History section and download the invoices you'd like to view or save. Note that we also send a receipt for the Create subscription signup charge to the email address we have on file for your subscription. To download a statement for your Utilities or API subscription, log in to Clipchamp Utilities and click on your user icon in the top right corner, then choose My Profile from the dropdown (or go to: https://util.clipchamp.com/en/profile). In the account profile, scroll down to the Statements section. This is where you can download the receipt for your current billing period as well as statements / invoices for all previous periods. Download your current statement by clicking on the date. And access previous statements by clicking on "Access previous statements". Then download the receipts you'd like to save.